Her latest novel is Unforgivable Love (William Morrow). 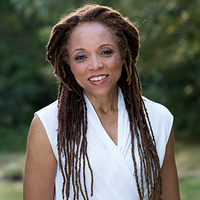 She’s also the author of an essay collection, Love’s Long Line, from Ohio State University Press’s Mad Creek Books and a memoir, This Child of Faith: Raising a Spiritual Child in a Secular World, co-written with her son Tain, from Paraclete Press. Her essays, short stories, and articles have appeared in Killens Review of Arts & Letters, Saranac Review, Numéro Cinq, Ruminate, Barnstorm Literary Journal, Sleet Magazine, NewYorkTimes.com, More, and O, The Oprah Magazine. Her essay “Why I Didn’t Go to the Firehouse” is listed among the Notables in Best American Essays 2017.